Carbon capture and storage comprises of a range of so-called “low carbon” technologies and schemes that are designed to reduce the harmful environmental affects from burning fossil fuels. As its name suggests, the idea behind carbon capture is to capture and store these emissions before they have chance to damage the environment producing a cleaner technology. Carbon capture and storage (CCS) technologies pitch themselves along side renewable energy technologies as a way of combating climate change. The environmental impacts of pulverized coal fired power stations is well known, but with co-firing, clean coal technology, post-combustion and reduced CO2 capture power stations already in existence, is there a need to capture and store carbon emissions deep underground for many decades to come. We all know that carbon dioxide (CO2) is an unavoidable by-product of burning fossil fuels. Carbon dioxide is a harmful greenhouse gas with the most obvious impact of CO2 emissions is in global warming. The impact arising from the release of millions of tons of CO2 into the environment needs to be carefully controlled as the atmosphere is not a giant reservoir big enough to accept all the CO2 emissions that are produced from whatever source. Some carbon dioxide (CO2) emissions are already being captured from the coal syngas (mixture of carbon monoxide and hydrogen) recovered from smoke of oil and gas fields by using chemical processes. But as natural gas is a very limited and a finite resource that we cannot easily replace with oil-based energy production, better and cleaner ways of burning coal are now being considered in order to keep the lights on. Today, renewable and green energy resources are being installed all around the world to bring about a cleaner and greener future. In the medium to long-term future (tens of years) fossil energy sources will still continue to satisfy most of the world’s energy demand. But in order to reduce those harmful greenhouse gas CO2 emissions by 2050, there is a requirement to produce more carbon capture and storage (CCS) projects worldwide. While energy generation from fossil fuel burning may be replaced in most part by various so called low-carbon or zero-carbon alternative energy technologies such as photovoltaics, wind turbines, solar energy, nuclear and etc, other cleaner solutions must be found in order to replace the use of fossil fuels as the world’s number fuel. But sucking the carbon out of a power stations burnt gasses and chimney flue emissions and storing it deep underground has a significant energy cost in itself. As well as the costs involved in retrofitting carbon capture systems to them, power stations performing coal with carbon capture and storage (CCS) can reduce the amount of energy produced increasing its cost to the consumer. Therefore it is necessary to find a safe and permanent way of storing CO2 emissions without having to invest large amounts of energy in doing so. The continued use of burning fossil fuels to produce energy my be more acceptable, if processes to capture the carbon dioxide directly from the atmosphere prove to be a viable and practical solution. The ability of plants and flowers to remove carbon dioxide from the atmosphere through the use of photosynthesis has been widely known for decades and one that could open up the possibility of reducing climate change while leaving the current infrastructure intact. The natural use of bioenergy and biomass technologies in combination with carbon capture and storage systems could result in a slowing down of the increase in the CO2 concentrations within the atmosphere. While such air and soil carbon capture ideas using plants, trees and soils are possible, the carbon is only stored within these temporarily. Since biomass can replace fossil fuels and be used to create more biofuel, there needs to be a greater understanding of the reusing of carbon from biomass and other such organic matter when burnt. Land use for sequestration (that is carbon capture and storage) of the atmospheric carbon dioxide in plants, plants die and their structures enter the soil being broken down by the action of the micro-organisms within the soil which then in turn release the captured carbon dioxide back into the atmosphere. Also the natural cycle of the soil, any carbon dioxide present can dissolve in the rainwater forming carbonic acid which can change the pH of the soil, affecting plant growth. If carbon capture and storage technologies are applied to biomass and co-firing combustion plants, the capturing of this carbon could result in net reductions of greenhouse gas emissions significantly reducing the relative advantage of renewables. Sustainable use of biomass energy could be carbon-neutral, as the CO2 produced from the combustion of biomass should be offset by the prior absorption of the carbon dioxide from the atmosphere by the action of photosynthesis when the biomass was being grown. If instead of it being released directly into the atmosphere, the carbon dioxide produced is captured and buried, then the possibility of negative emissions could be created. We have seen here that “carbon capture”, more specifically, carbon dioxide capture and storage of fossil fuel gasses is the key to long-term sustainable use of traditional fossil fuel energy generation. Carbon sequestration could result in the net reductions of greenhouse gas emissions significantly reducing the relative advantages renewables have in terms of carbon and energy savings. Creating artificial carbon storage facilities, either by storing carbon in plants and soils, or through deep burial of the carbon captured from the burning of biomass plants in place of fossil fuels still needs to be better investigated. 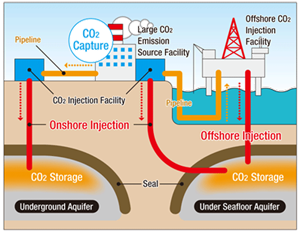 Fossil fuel energy combined with carbon capture and storage may enable us to continue to use and burn fossil fuels well into the future by collecting the harmful carbon dioxide (CO2) and storing it safely underground in suitable geological formations for the long term in much the same way as we now store nuclear and radioactive waste. But ultimately, renewable energy technologies including, in particular, solar photovoltaics, wind energy, hydro and tidal energy production is the way to reduce greenhouse gas emissions. To learn more about sustainable development, or if you just want to explore the advantages and disadvantages of how sustainability works, then Click Here to get your copy of one of the top books on sustainable development today direct from Amazon and learn how living sustainably need not cost the Earth. i like this. storing carbon explained in simple terms…thanks a lot!! !